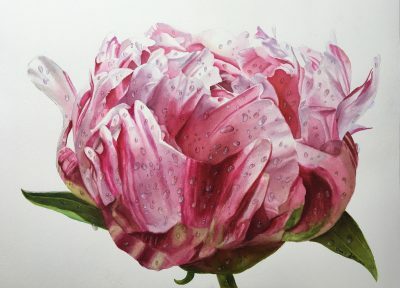 Want to learn how to watercolor but you don’t know where to start? Want to improve your painting skills and take your art to a highler level ? Painting with watercolors makes fun. But it can be a hard challenge when you don’t know which materials you need to have and when you don’t know how to start. If you don’t know which materials you need to have for painting in watercolor then have a look on my list of Watercolor Tools for Beginners. 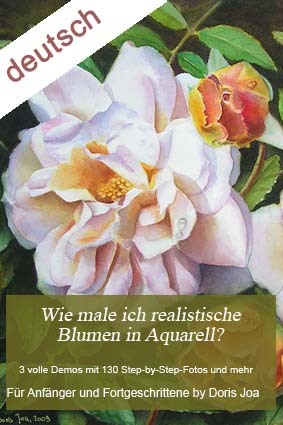 Want to create realistic looking flowers and roses? Want to create successful paintings and captivate the viewers of your work? Painting with watercolors makes a lot of fun. 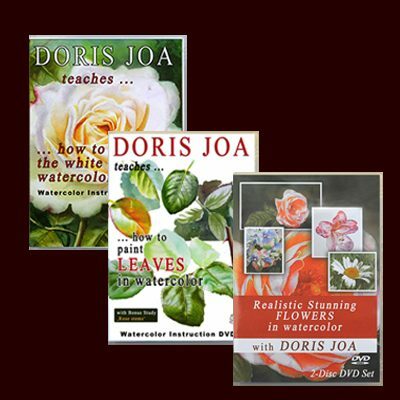 My Watercolor DVDs & Videos teach you all you need to know how to create stunning paintings. 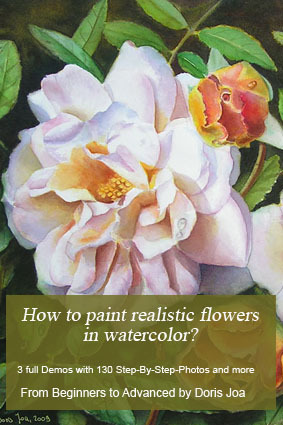 Learn everything you want to know about watercolor painting in easy-to-follow-steps. Many artists have a hard time to learn how to paint in watercolor. Do you want to learn how to start or do you want to create better paintings and not get overwhelmed? Work with me and save time, money, and get the right knowledge so you can finally move ahead in your art career. 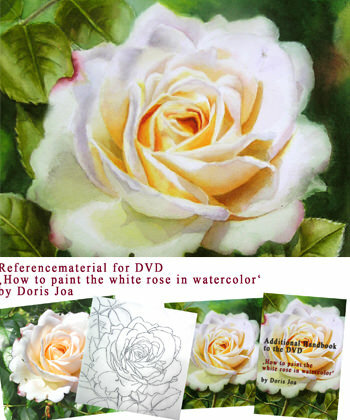 Learn how to watercolor with my Watercolor DVDs or online with my Watercolor Videos. Free Art Lessons and demonstrations are also available. Want to take your art to a highler level but you don’t know how? Do you want your paintings speak to the viewers? Do you want to captivate them? Let me help you on your art journey. Get the right knowledge and lots of practical tips so you can adapt my art instructions to any subject and within a short time you will learn how to create stunning paintings. You already know something about watercolor or are you maybe a beginner and don’t know where to start? You are stuck. I am here to help you improving your painting skills and taking your art to a higher level. My teaching has helped many artists improving their paintings. I specialize in extending artists so you too can create stunning paintings that speak to and captivate the viewers of your work! 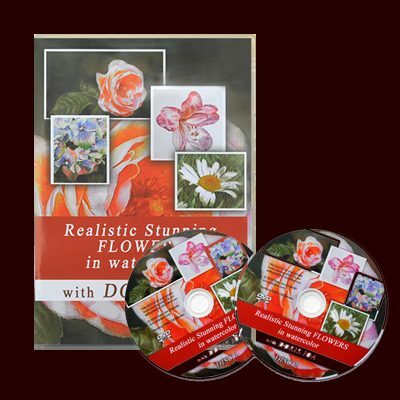 show you everything how to create successful and stunning paintings. 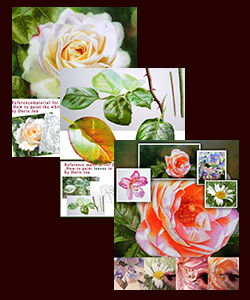 Each watercolor lesson is offered with full reference material and list of material. For detailed description and more previews please click on the titles or images below. 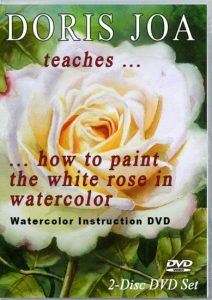 This Painting Lesson is about a complete painting.We start with the white rose, add the leaves and the background. All needs to work together. Often it happens that a painting looks more like a puzzle than a painting. I show you how to create a successful painting. You will love this lesson. how to add leaves, stems and background. how to finish such a complex painting. In this study you can use the whole knowledge and adapt it to any painting subject and you will amaze the viewers of your work. Learn all what is important about edges, learn more colour temperature and get a Bonus Study. You also get an additional handbook full with valuable tips. Print it out or view it on your tablet, smartphone or computer as this handbook is a .pdf-file. You can make a purchase below or click for more detailed information, more video-previews and testimonials. 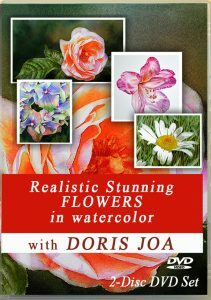 This is a MUST-HAVE for all flower and nature painters and a wonderful addition to each of my flower lessons. 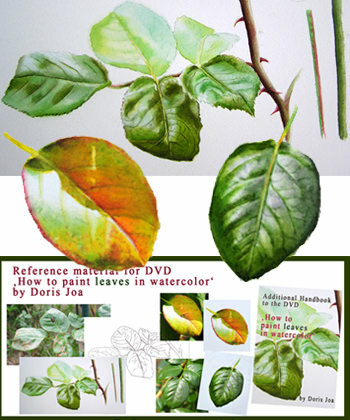 how to paint leaves with fall colours. 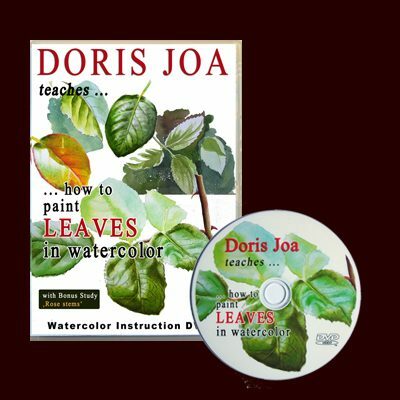 5 different studies of leaves are painted and you also will get a handbook and a Bonus Study – get this lesson to a fantastic price. 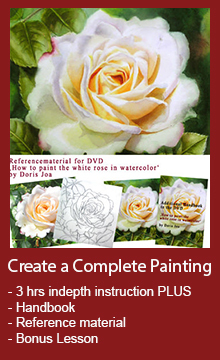 This Painting Lessons is about how to paint different flowers: The Center of a white Daisy, the beautiful petals of a blue hydrangea, a pink rhododendron and the beautiful Rose Bonita Renaissance with an atmospheric background. how to create the illusion of reality. You will also learn how an atmospheric background supports a glowing rose painting. 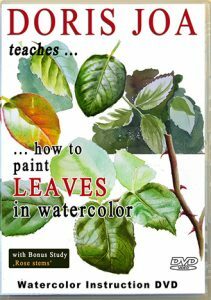 There is so much to learn in this Watercolor lesson, over 4.5 hours of invaluable art instruction. 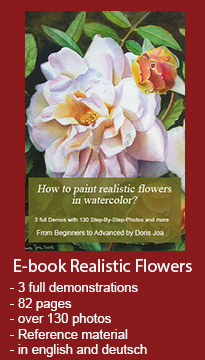 With this E-book you can learn how to paint realistic flowers in watercolor. This e-book is a .pdf-file and you will be able to read it on your computer or on your smartphone or tablet. Of course you also can print it out. You can make a purchase below or click on the images for more detailed information, more video-previews and testimonials. 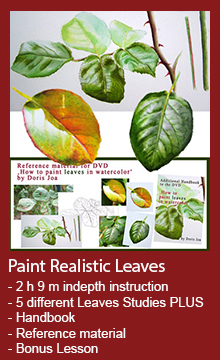 All these DVDs/Videos & the E-book help you improve your painting skills and to capture the viewers of your work! Is the format of a DVD the best for you, so you can watch it on your TV or computer? All Watercolor DVDs will be shipped within 24 hours after receipt of payment. Free shipping is possible. Do you want to watch the lessons NOW on your tablet, computer or smartphone? Then the format of my Online Videos should work best for you. The login information will be delivered to your E-mail box immediately after your purchase. 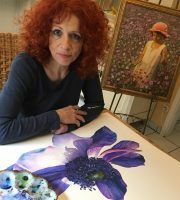 Doris Joa is a passionate and professional watercolor and oil artist from Germany. 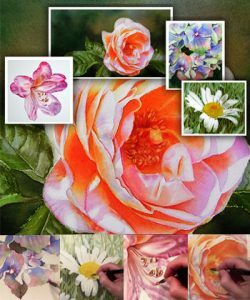 Her paintings and also her Watercolor DVDs are selling world-wide and her work has been published in several art magazines. 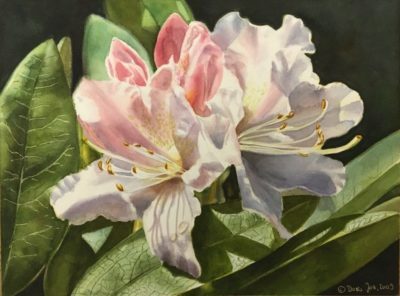 She teaches how you too can paint in an uncomplicate way – with the common watercolor techniques. 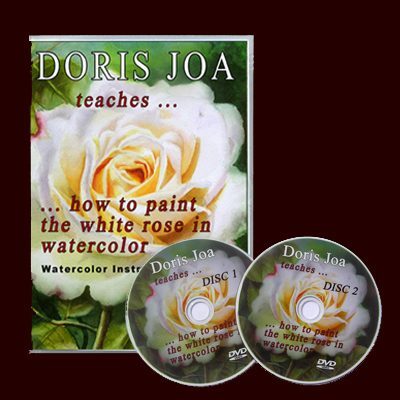 Her lessons are created with passion so you too can learn how to create successful paintings. 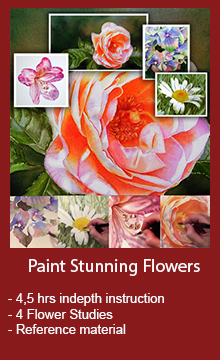 She explains what she does and why, so you too can create a stunning painting by your own. Learn to use the different kinds of edges, learn to use warm and cool colours as well as lights and darks to create the form of your subjects. Learn to integrate your subject into the background, learn to create beautiful colour mixes for your shadows. Painting is not only about colouring a subject – it is so much more! 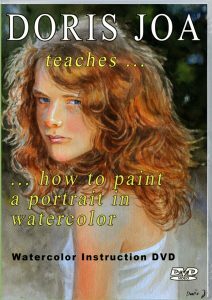 My Watercolor DVDs can be viewed on any DVD player or on your computer. FREE shipping is offered when two or three DVDs bought together or check the special offer to save more money when buying all DVDs together. Note: The Watercolor DVD(s) will be shipped within 24 hours after the receipt of payment. Shipping costs are 8 USD worldwide. Free Shipping is possible when two or three DVDs are bought together. Then the code for free shipping is: dvd-free. Click here to get free Art Lessons for better paintings!